These videos are awesome! I remember doing this several years ago. It was before I had a projector in my classroom -- we had to go to another room! At that time, they were a webcast format so we had to schedule it and show up at a certain time. I love that they are now just a video that you can watch any time. It really helps to give you a "picture" of what the Pilgrims were like and a view of the Plimoth Plantation. Click here to start the virtual field trip! Use this resource to let your children choose Pilgrim names. There are Pilgrim names (all the passengers on the Mayflower -- even though they weren't all Pilgrims) for boys and girls. This download also has a recording sheet for you to keep track of their new names and some simple desk tags. Click on the picture above to be linked to the free download. 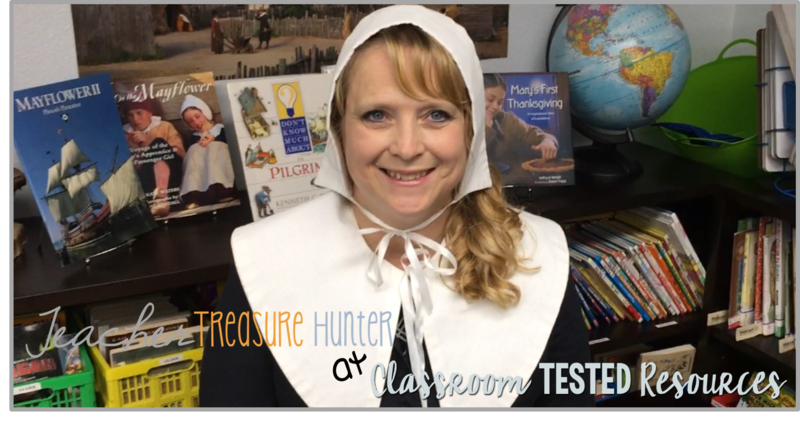 Need more resources for teaching about Pilgrims.This unit includes a script for taking a pretend Mayflower voyage, worksheets, writing prompts, hornbook pattern,and non-fiction reading passages. Click here to learn more! Thanks for reading! Don't forget to download your freebie and share this post with your friends. Keep following Classroom Tested Resources for more great ideas! Great job on your video! Impressive!!! I love your video, Melissa! Great job. I love the virtual field trip. It's always my favorite. Thanks Comprehension Connection & Sweet Integrations! I love teaching about the Pilgrims. Now, I teach about American historical figures and at Thanksgiving we have a Colonial Day celebration in 3rd/4th. Maybe a video with a mob cap is next! LOL! Love your video! This was a great description of an engaging lesson for kids!